Doesn’t need to be super flat for an out feed table. If you’re worried about it splitting you could add some screws which will be hidden under your laminate. I think it’s fine. No one else would know. But you will, it will haunt your dreams at night and one day it will blow up. Na just kidding I think Brain is right, no big deal in that situation. I wouldn’t redo it. It’s not like it’s going to come apart. You’re just sliding wood across the top. Long as it’s flat enough, I’d not worry about it. 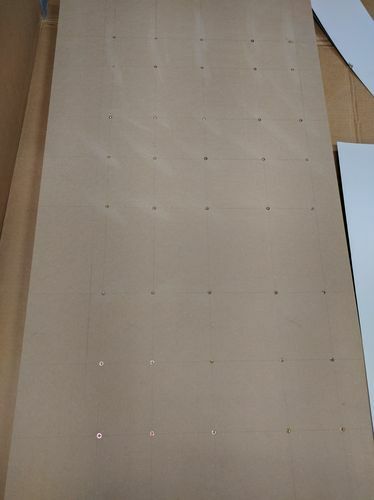 I laminated two sheets of MDF once and I pre-drilled countersunk holes on one sheet (about 8 inches on center). I painted on the glue and then drove in all the screws. As I recall I just left the screws in. No clamps. To make my job easier I drove several thin brads into once surface and clipped them so only about 1/16” was showing. It kept the boards from sliding around on the glue. This is a process I use frequently when gluing up. The nails never show and are not part of the joinery; just part of the positioning. Thanks everyone, I decided to drill and countersink a copious amount of screws… Should do the trick. I don’t think you added enough screws. Perhaps you should wrap it a few times with duct tape also. I don t think you added enough screws. Perhaps you should wrap it a few times with duct tape also. Delamination was not going to be a problem even before. For something like that I don’t mess with clamps. Just glue and screws. You’ll be fine. I made sure to mark where the miter slots were, so I should be set on that front.